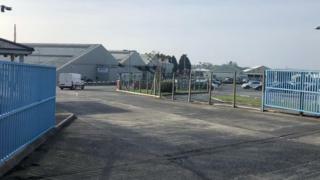 A car parts manufacturer is set to cut 95 staff from its Llanelli factory after a "significant drop in sales". Japanese firm Calsonic Kansei employs around 300 people at the Carmarthenshire plant and develops cooling systems and air conditioning components. The company was offered a £4.4m grant by the Welsh Government in December in order to create 88 jobs. Economy Minister Ken Skates blamed "serious instability" around Brexit. Llanelli AM Lee Waters, who is also deputy economy minister, told BBC Radio Wales it was "very troubling news". The Calsonic factory has been operating since 1943 and produces parts such as radiators and oil coolers for global car companies including Toyota and Nissan. "The company intends to do everything reasonably possible to reduce the impact of this proposal on its employees." The Unite union blamed the cuts on the UK government's "failure to have a manufacturing strategy". "We are seeing the automotive industry closing factories, we are seeing the automotive industry moving their work abroad, which is then having an impact on the supply chain in the UK," said Paul Evans. Mr Skates described the news as "incredibly disappointing" and blamed it on serious instability caused by the UK government's Brexit negotiations. Welsh Secretary Alun Cairns, a member of the UK government cabinet, said "all politicians" had a part to play in the ongoing Brexit uncertainty. He called Calsonic's decision "disappointing", adding: "Jaguar Land Rover are a significant customer, they've not been getting the greatest success of sales in recent months. "Naturally, there's a knock-on effect to the component suppliers." The announcement is the latest blow for jobs in the town - in January, car manufacturer Schaeffler announced it was closing its factory, with 220 jobs to go, and the future of Tata Steel's Trostre packaging plant is also in doubt, risking a further 650 jobs. Speaking on Good Morning Wales, Mr Waters said while he was troubled by the announcement, "we shouldn't be surprised". "This was part of the debate prior to the referendum, so in that sense it is not a surprise but now we are seeing the reality of it," he said. Mr Waters said the Welsh Government's grant was still on the table to create jobs in the electrical automotive sector, but had not been taken up by the company. "Their business model has been so affected by Brexit that two major customers have said to them that because of Brexit, they are no longer coming to Llanelli," he added. Helen Mary Jones, Plaid Cymru AM for mid and west Wales, said she was seeking answers from the Welsh Government over what can be done to protect workers. "This is deeply troubling news for Llanelli and the wider area," she added. Neil Hamilton, leader of UKIP Wales and regional AM for mid and west Wales, said the job losses had "absolutely nothing to do with Brexit". "European car manufacturers' biggest problem is the EU, UK and Welsh Governments' manic policy to ban diesel and petrol engines within 20 years," he said. The automotive industry is facing turbulent times - pressures include the drive for electric vehicles and a drop in car sales in the UK. There is also the uncertainty of Brexit in an industry that relies heavily on moving products across EU borders without tariffs, additional regulation and paperwork. We've seen car companies such as JLR put production on hold, which has an impact on suppliers including Calsonic. Another company Calsonic supplies, Honda, is closing its factory in Swindon. Japan now has a trade deal with the EU which makes it easier and cheaper for cars produced in the former to be exported into the latter. The losses at Calsonic will be well-paid, skilled jobs and won't be easy to replace, particularly with the closure of Schaeffler.